Professional Editor: John W. Campbell, Jr. 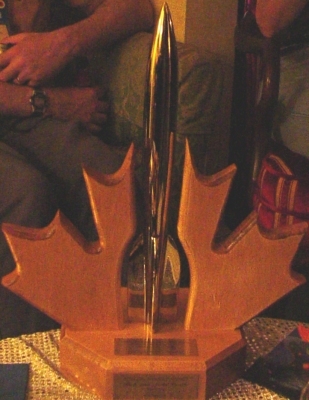 The Hugos were given out at ConJosé on Sunday, September 1, 2002. Tad Williams served as the MC. Jeff Walker was the desginated acceptor for all of the Dramatic Presentation Hugos, except for one. 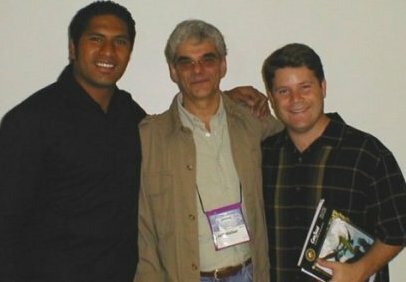 The designated acceptors for Lord of the Rings were Sala Baker (Sauron) and Sean Astin (Sam). Unfortunately, they arrived at the pre-Hugo reception a little late for the nominee photos. So, as we walked them over to the auditorium, we had them stop long enough for the "traditional" nominee photo. 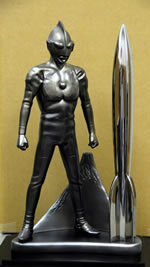 More photos from the pre-Hugo reception and the Hugo Awards. 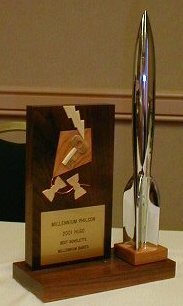 The 1954 Retrospective Hugos were awarded at Noreascon 4 on Friday, September 2. Peter Weston and Bob Eggleton served as hosts for the evening's events. Best Professional Editor: John W. Campbell, Jr. Details on the design of the Hugo statue. 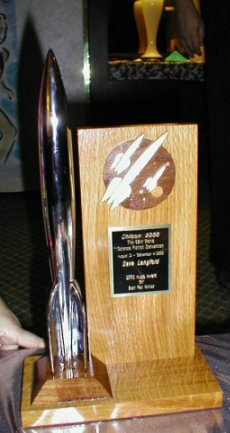 Photo originated at The Hugo Awards. Hugo winners from the 90s * * 10s.